Would you like ‘something a little different’ at your next celebration or event? We are always open to enquiries if you wish to consider booking us. For private events, celebrations and functions we charge a moderate fee covering our expenses to enable us to continue. 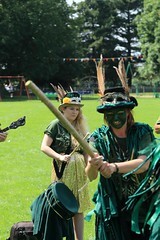 We have danced for fetes, WI meetings, handfasting, school fairs, steam fairs and more. We would love to come to your wedding, birthday, anniversary or other celebration. 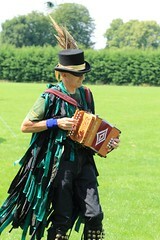 We do also welcome enquiries on fund raising events. Should you wish to see us in action prior to making a booking, please feel free to check out our listings, here on this site or you will find updates on ‘Facebook’ to see where we are next out in public. 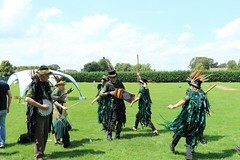 We dance at various locations including music, dance and folk festivals throughout the year. We are found most Wednesdays throughout the summer months at one or other watering hole in the region. We cover a variety of dances and if the occasion calls for it, we can talk on the history of morris and the different styles of morris. We all have great enthusiasm for dance and if required (or the opportunity arises) will get the audience involved as well, teaching those who wish to try, a simple dance or two. This goes down very well with everyone, whether participating or watching.